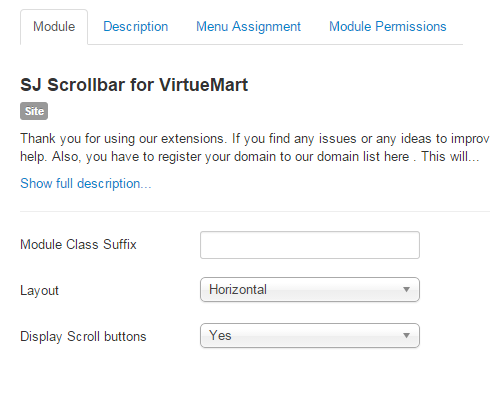 This guide will help you install SJ Scrollbar for VirtueMart step by step. Compatible with version Joomla: Joomla!2.5, Joomla! 3.x and Responsive layout. Firstly, you need to UNZIP file that you have downloaded. Please note that you should choose module package that are suitable with each Joomla version which you have just downloaded. In your Administrator page, go to Extensions -> Extension Manager. In this page, click Browse, select module package. Please wait for module being installed, usually within several seconds. Now go to Extensions -> Module Manager, click Select Type box and choose the module you have installed. Note:We used the images of module’s installation on Joomla 3.x to illustrate. After installing, go to Extensions -> Module Manager and find SJ Scrollbar for VirtueMart to configure. Module Class Suffix – Allow to input class suffix. Layout – Allow to select vertical/horizontal. Display Scroll buttons – Allow to display scroll buttons OR not. For devices have screen width from 1200px to greater. For devices have screen width from 768px up to 1199px. For devices have screen width from 480px up to 767px. For devices have screen width less than or equal 479px. Pane height – Allow to insert height of viewport, include horizontal scrollbar. Item width – Allow to insert width of product. # Rows – Allow to insert the number of rows when to show product. Category – You can choose categories which you want to show. Child Category products – Allow to include or exclude products from child categories. Category Depth – The number of child category levels to return. 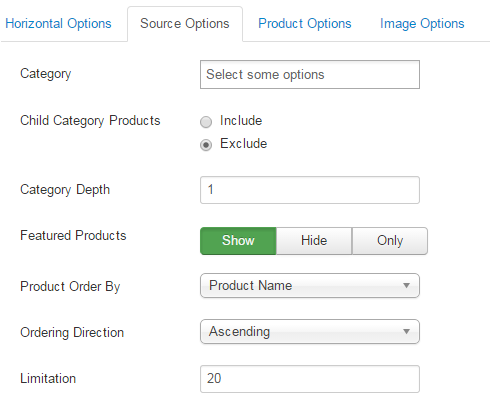 Featured products – Allow to select to show, hide or only display Featured products. Ordering Direction – Select the direction you would like products to be ordered by. Limitation – Maximum number of products to display. Enter “0” for unlimited. Display Title – Allow to show/hide title of product. Title Maxlength – The maxlength of product’s title. Set “0″ to show full title.. Display Description – Allow to display description of product OR not. 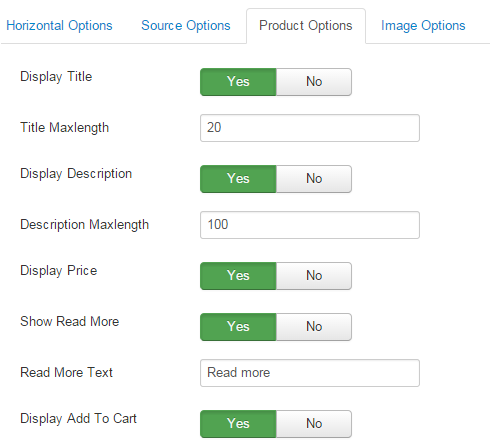 Description Maxlength – The max length of product’s description can be showed. Display Price – Allow to show/hide price of product. Show Read More – Allow to show/hide link for readmore. Read More Text – Allow to insert text for link of read more. Display Add To Cart – Allow to show/hide button add to cart. 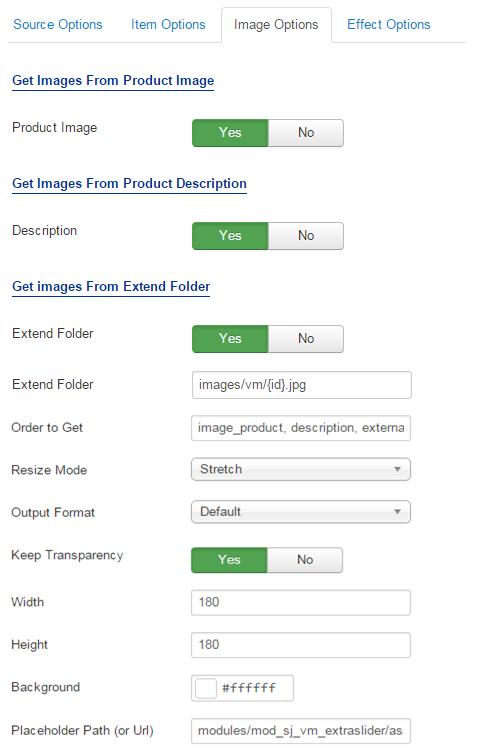 Product Image – Allow to show image product OR not. Description – Allow to show image description OR not. Extend Folder – Allow to show/hide Extend Folder. Extend Folder – Set path to external image folder used by option above. Order to Get – Order to Get image. Resize Mode – Allow to choose the mode of image resizing. Output Format – Output Format after resizing. Keep Transparency – Allow to keep transparency of image OR not. Width – Allow to set width of image. Height – Allow to set height of image. Background – Allow to set the color of image background. Place holder Path (or Url) – The path or URL of Default Image. Alternative Layout – Set custom layout for this module. Include Jquery – Allow you to include Jquery OR NOT. Pre-text – The content to show at the top of module. Post-texl – The content to show at the end of module. Cache Times – The time to cache. 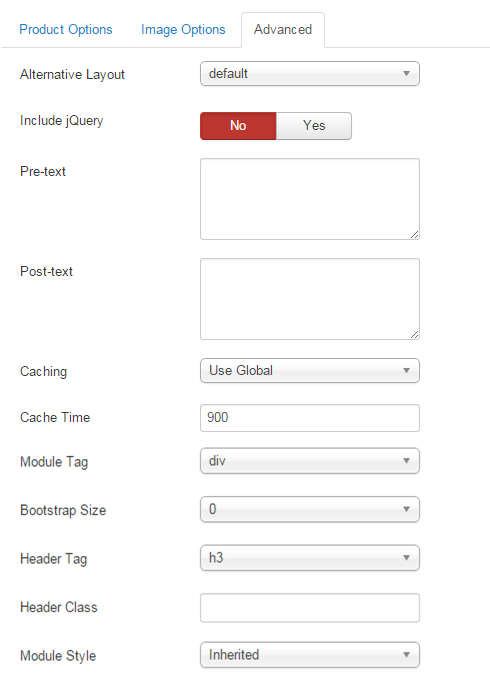 Module Tag – Allow to select the HTML Tag for module. 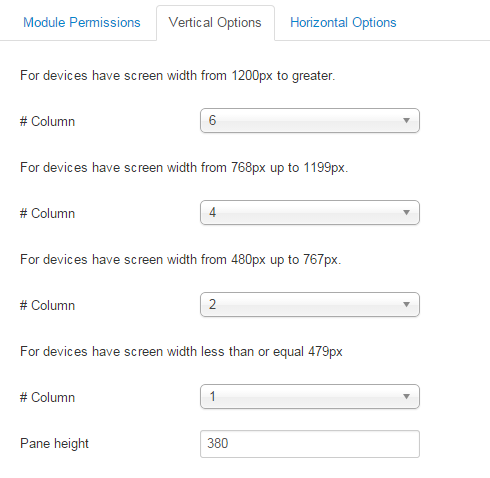 Bootstrap Size – Allow to set the number of columns that module will use. Header Tag – Allow to select the HTML Tag for module header/title. Header Class – Support the CSS Class for module header/title. Module Style – Select module style.